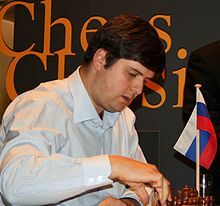 Peter Svidler, born 17 June 1976 in Leningrad, is a Russian chess Grandmaster, and six times Russian chess champion. Peter Svidler learned to play chess when he was six years old. In 1992, he tied for 1st with Ragim Gasimov in the USSR Junior Open Chess Championship. He became a grandmaster in 1994. He has been Russian champion six times (1994, 1995, 1997, 2003, 2008, 2011). This is a record for this high-class event, which has a long history. In 2001, he reached the semi-finals of the FIDE World Championship. He came second (with Viswanathan Anand) in the FIDE World Chess Championship 2005 in San Luis with 8.5 points out of 14 games, lagging 1.5 points behind the winner, Veselin Topalov. In an interview given for World Chess Network he said: "I only prepared seriously for San Luis, and I think it has paid off. But in general I spend most of my spare time with my wife and kids, so my relative success in 2005 was a pleasant surprise". His San Luis result earned him direct entry to the World Chess Championship series of 2007. In that tournament he scored 6.5 out of 14, placing 5th out of eight players. In 2006 he came second behind Alexander Grischuk at the World Blitz Championship in Rishon Lezion, Israel, with 10.5 points out of 15 games. He also finished tied for first with Vladimir Kramnik at Dortmund 2006. Svidler has won the FIDE 2011 World Cup in Khanty-Mansisyk Siberia. The final was in September. Svidler took the $120,000 first prize after beating his fellow countryman, Alexander Grischuk 2.5-1.5, in the best-of-four game final. It was a crushing psychological win for Svidler, who took adantage of his opponent's bad time-management. Svidler steered the games into lines that had Grischuk thinking from the very early stages. Svidler has now become the first Russian to win the World Cup title. His back-to-back major title wins of the Russian Championship followed by the World Cup has Svidler once again into the world’s top ten. Both Svidler and Grischuk also earned qualification for the 2012 World Championship Candidates tournament. And in the all-Ukrainian battle for the third Candidates spot, Vassily Ivanchuk won 2.5-1.5 against Ruslan Ponomariov. ↑ "USSR Junior Open Chess Championship, Yurmala 1992". RusBase. Retrieved 2009-07-31. This page was last changed on 11 March 2017, at 12:58.